You'll never see a return on your investment. Websites don't cure problems. Having a business card sitting in the pocket of your jacket doesn't help your business right? Having your website on page 13 of google won't help you get in front of people every month looking for your expertise. You've got a couple choices when it comes making your website a profitable investment. Search Engine Optimization - The process of ranking your website on google. Due to the competitive nature of this process will take upwards of 12-18 months to complete if you select the right Marketing Agency that is... Select the wrong one and you'll never get there. Pay Per Click Ads - If done correctly this is the most powerful way to get fast results for your office. Most companies will just send visitors to your website and deliver statistics on your click thru rate, impressions, page views and unique visitors. 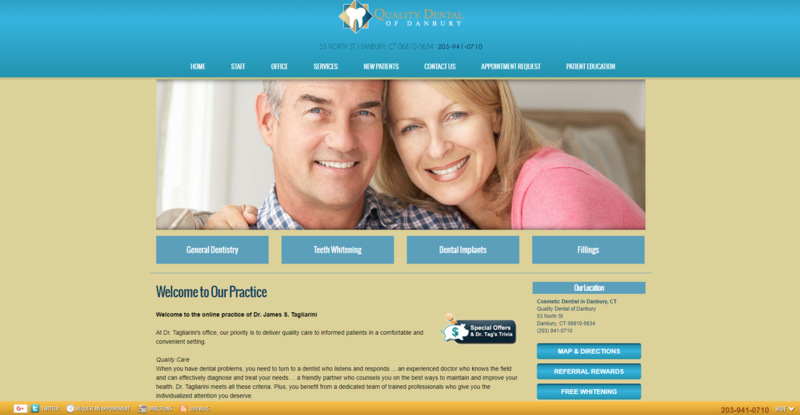 One of our client's old website is pictured above on the left. As you can see the contact number is small and there is no direct contact form in sight. One of our associates website is on the right. As you can plainly see it's straight to the point with an fishing line form. All the person needs to do is start filling out that form and soon they'll be on the hook to submit their info the TMJ Specialist. Websites are like business cards.. They don't do anything for you sitting on your dresser or page 2 of Google. Just because you have a website doesn't mean people will find you on Google, Yahoo or Bing. As of April 2015 your website must be mobile optimized or it will be penalized in the Google Search Results. Receive a Free Quote for your Perfect Website.